MCN was founded for the community, by the community. Here are some ways you can keep up with MCN and play an active role in our community! Sign up to get updates on upcoming workshops, volunteer opportunities and program accomplishments through our MCN newsletter delivered straight to your inbox. Sign Up Here. MCN is powered by the dedication and energy of its volunteers. There are many opportunities to get involved and put your talents and interests to work to serve the community. You can pitch in at the MCN Serves monthly soup kitchen or become a mentor by joining MYNYC Bridge! MCN’s friends and allies who stay in touch via Facebook and Twitter are often the first to hear about exciting initiatives or see photos from recent events. 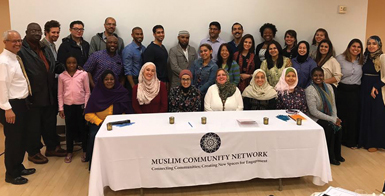 Our MCN News and Events pages have the latest info on new career and volunteer opportunities, not- to- be- missed events, schedules for our Community Education program, and when we disseminate news and information.